Some over-the-counter medicines force your body to cool down to a normal temperature, although a fever is a sign that your body is fighting an infection. So instead of running to your medicine cabinet, try a natural remedy. These remedies can soothe your fever gently. This way your immune system can still do the job it was designed to do. 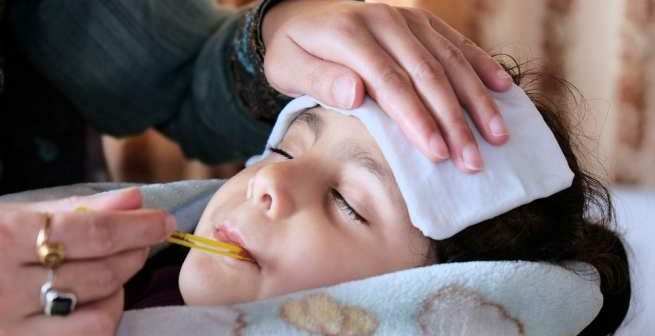 Simply stated, a fever is a natural defense mechanism, usually triggered by infection. The increase in body temperature triggers a number of internal processes designed to destroy bacteria and germs that will make you sick. This is why it is important not to suppress a fever. A normal body temperature is around 98.6 F. If your temperature increases by 1-5 degrees, it isn’t usually cause for concern. A fever below 103 F isn’t serious in adults. However, for infants below the age of 3 months, even a slightly elevated temperature could mean trouble. Take your baby to a doctor immediately if they have a rectal temperature above 100.4 F.
Echinacea is a powerful herb that has been used for centuries. Scholarly studies suggest that drinking an Echinacea-based tea when you first start feeling feverish can boost your immune system. This will help you kick the infection and get rid of a fever faster. You can find teas that contain Echinacea at most health food stores. Another way to treat a low fever is to use ginger. Ginger’s antibacterial properties make it effective against fever, cough, and other common symptoms. Look for ginger-based tea in the grocery store or make your own cup at home using sliced ginger root. Fluids are important for helping the body regulate temperature, flushing out unwanted germs, and helping your body function smoothly. If you are feeling feverish, make sure to drink a lot of water and other fluids. Maybe the best way to get rid of a mild fever is to get a lot of rest. A fever is your body’s way of letting you know that it is working hard to keep you from getting sicker. So give your body the energy and time it needs to fight the incoming germs by sleeping. A high fever can be very serious. But an occasional low-grade fever is just your body’s way of healing itself. All over-the-counter medicines have risks and side effects. Medicines that lower fever suppress your body’s natural healing process. So instead of turning straight to a pill bottle, start with one of these alternative remedies.